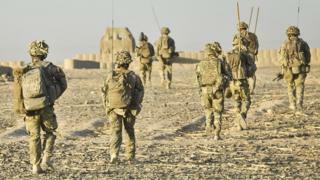 A scheme aimed at helping Afghan civilians who worked as interpreters for the Army has proved an "utter failure", MPs have said.The Commons Defence Committee said not a single person potentially at risk of Taliban reprisals had been resettled in the UK so far via the initiative.It had gone to "considerable lengths" to stop their relocation, it argued.Campaigners warned of "false hopes" but ministers said the aim was to enable people to live safely in their country. The cross-party report said the Intimidation Scheme's shortcomings were in marked contrast to another initiative, known as the Redundancy Scheme, which has seen 1,150 Afghans re-homed in Britain. It called for a more "sympathetic approach" to those who risked their lives to support British forces during their 13-year combat mission in Afghanistan, which ended in 2014.About half of the approximately 7,000 civilians who worked for the British in Afghanistan were interpreters and they often worked in dangerous situations. The Redundancy Scheme is open to Afghan civilians who had been working in front-line roles for at least 12 months when the UK began to reduce its troop presence in late 2012.The committee noted that despite previous criticism of its criteria, it had been "generous and proportionate".In contrast, while the Intimidation Scheme was "in theory" open to all civilians working for the British, the report found that it had focused "overwhelmingly" on ways of keeping them in Afghanistan, through internal relocation or the offer of security advice, and that resettlement to the UK was seen as a last resort. The report also criticised the Afghan government, which was involved in creating the schemes, saying its claim that relocation might lead to a "brain drain" was "disingenuous". "It is impossible to reconcile the generosity of the Redundancy Scheme with the utter failure of the Intimidation Scheme to relocate even a single locally employed citizen to the United Kingdom," it concluded.